Please pray for the repose of the soul of the Most Rev. 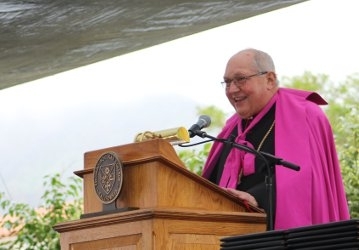 Robert C. Morlino, Bishop of Madison, Wisconsin, and a longtime friend of Thomas Aquinas College, who died Saturday night after suffering a cardiac event three days earlier. A native of Northeastern Pennsylvania and a graduate of the Jesuit-run Scranton Preparatory High School, Bishop Morlino was ordained to the priesthood for the Maryland Province of the Society of Jesus on June 1, 1974. He held degrees from Fordham University, the University of Notre Dame, the Weston School of Theology, and the Gregorian University. He became a priest of the Diocese of Kalamazoo, Michigan, in 1981, and Pope St. John Paull II made him Bishop of Helena, Montana, in 1999, where he served until his appointment as Bishop of Madison in 2003. His Excellency first visited the College’s California campus in 2007, when he helped to inaugurate the new academic year by serving as Convocation Speaker. When he returned as Commencement Speaker last spring, he also served as the principal celebrant and homilist at the Baccalaureate Mass. His Commencement Address was picked up by news organizations throughout the world because of its forthright and charitable defense of the Church’s teachings on marriage and human life, challenging the graduates to be “politically incorrect.” Fittingly, on that day the College presented him with its highest honor, the Saint Thomas Aquinas Medallion, in recognition of his lifelong fidelity to the magisterium.